KUALA LUMPUR: England’s World Cup campaign was put to an end when Costa Rica upset Italy 1-0 last night in Group D’s game, halting the Three Lions’ team from advancing to the knockout stage for the first time since 1990. Fulham striker Bryan Ruiz scored the winning goal at the game’s 44th minute with a header, receiving a corner kick from teammate Junior Diaz at Recife's Pernambuco Arena. The goal came just moments after referee Enrique Osses denied a clear penalty for Costa Rica when Joel Campbell was hustled over by Giorgio Chiellini. With this win, Costa Rica only needs a draw against England in their final first round match next Wednesday to top the group. The Los Ticos previously won 3-1 over Uruguay and their win last night was historical as this World Cup edition saw them beating two former World Cup champions. Azzuri now faces a crucial final group match against Uruguay that sees a draw as sufficient for the Italians but a Uruguay win would show them the exit. Costa Rican goalkeeper Keylor Navas deserves a pat on his back when he did a tremendous job, saving few daring tries from Italy’s attacking such as Mario Balotelli, Daniele de Rossi, Antonio Cassano and Alesio Cerci. 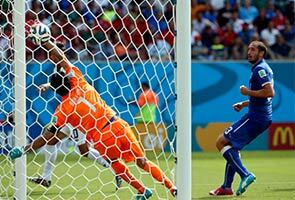 Costa Rica became the fourth team after Netherlands, Chile and Colombia to make it to the knockout stage. Another team that will advance to the stage from Group D will be determined between Italy and Uruguay on June 25. England joins Cameroon, Spain and Australia to exit the quadrennial tournament. England lost 1-2 to Uruguay on Thursday, and needed Italy to defeat Costa Rica for a least a glimpse of hope to qualify to the next round. It is the earliest exit for England since 1958. According to AFP, the English Football Association said coach Roy Hodgson would remain in the job until 2016 despite the pressure for the team’s feat in the ongoing World Cup. "We are supportive of Roy Hodgson and would like him to stay as manager," the British media reported FA chairman Greg Dyke as saying.